If the Temple Mount is Heaven, then the valleys around it represent the opposite. The valleys surrounding Jerusalem's Old City have long been associated with Hell and the Last Judgment. According to sources in the Bible and elsewhere, and archaeological finds, the Kidron and Hinnom Valleys were a busy burying ground. Hundreds of graves, mostly from the Second Temple Period and belonging to wealthy Jews, lie scattered here. A number of these have been excavated. Work on this is still continuing. The Kidron Valley, actually a wadi as it consists of a dry river bed, cuts along the Old City on the east and north side. On the east lies the Mount of Olives, which has one of the oldest Jewish cemeteries. On the north, Mount Scopus gently slopes upwards. The Kidron valley was thought to be the place of the last Judgment due to the combination of quotes by two prophets. The visionary Joel wrote that the final reckoning of God would be in the valley of Jehoshaphat. It was also simply the name of one of the kings of Judah, who was buried in the valley and gave it its name. Zechariah thought that the day of reckoning would take place on the Mount of Olives. People who let themselves be interred there hoped to be the first in line to be received by God's redeeming justice. In the depth three magnificent structures can be seen. They can be reached by foot from the Mount of Olives. The first and most famous one is the Tomb of Avshalom. As is usual with almost all of these tombs, it has received a name that is very far removed from the real purpose and history of the monument. The first 'discovery' that it had something to do with Avshalom was by the medieval writer Benjamin of Tudela, who freely interpreted the text in 2 Samuel 18:18: 'Avshalom in his lifetime set up for himself a pillar that is in the King's Valley." Local Arabs also gave the monument a name, 'Pharaoh's Hat', because the top is conical. This elegant shrine has nothing to do with Avshalom, the rebellious son of David. It dates from the first century. In David's time Jerusalem only consisted of a small settlement on the ridge south of the Temple Mount, which is known as the City of David. It was also here that the kings of the First Temple Period were buried, so it would be unlikely to find a grave of David's line in the Kidron valley. So who was buried in the 20 meters high Avshalom's Tomb then? It probably belonged to the adjacent burial cave of Jehosphahat. The memorial or 'nefesh' is cut in the rock up to the roof and has Ionic columns on its four sides. The grave itself is decorated with vine leaves and bunches of grapes and has eight separate burial chambers. According to the custom of the times, the dead would be lain in one of these chambers. Often the bones were later collected and put in a stone chest with lids, or ossuary. These were also found in great abundance in the valleys. The most impressive ones are on display in the archaeological section of the Israel Museum. 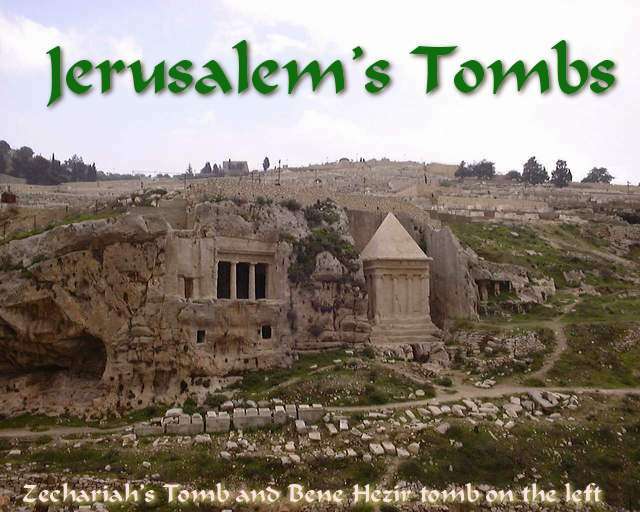 The second tomb is the Tomb of Zechariah, again an incorrect name. It probably served as the nefesh of the tomb below it. This is indicated by the Hebrew inscription on the architrave above the two Doric columns on the lower monument on the south side, which says that it belonged to the priestly family of the Bene Hezir. The second structure on the north side is the actual tomb. The Hezirs worked in the Temple. The name also appears in the Bible: "the seventeenth of Hezir (1 Chronicles 24:15)." They continued serving also in the Second Temple, because they are again mentioned among the functionaries (Nehemiah 10:20). The Doric columns of the Bene Hezir tomb are carved from the rock. The upper tomb of Zechariah is a square structure with Ionic columns and covered with a roof in the form of a pyramid. There are other tombs in the Kidron valley, but they are less known, partly because they are in the village of Silwan on a separate hill. This was sometimes called the Mount of Offense; once the heathen Temple for Solomon's wives stood on its summit. The Arab village itself is not a popular tourist spot. It is built on a cemetery of the Iron Age. Some of the graves here are very old, and go back to the ninth century BCE. They were dug by Phoenicians. Their graves, in the middle of the rock, were never used. They are just empty holes. At a later time Jewish Temple officials designed graves for themselves in Silwan. One of these is known as the Tomb of Pharaoh's Daughter, after a thought that it was a temple which Solomon had built for his Egyptian wife (1 Kings 3:1). It is located in the north of the village, and looks like a house without windows. The structure is similar to the Tomb of Zechariah and consists of a rock-hewn cube with a pyramidal roof on it. Again this memorial is very old and dates from the 8th Century BCE. A hermit who inhabited the tomb in medieval times renovated the building and damaged the Hebrew inscription, of which only two letters remain in the upper left corner. One other tomb in Silwan is very interesting for its inscriptions, which has been brought to the British Museum. One text says that it is the sepulcher of "Yahu who is over the house. There is no silver and no gold here but his bones and the bones of his slave-wife with him. Cursed be the man who will open this." The tomb is identified as belonging to Shebna, one of the diplomats sent by Judean king Hezekia to make peace with the Assyrians in 701 BCE (2 Kings 18:18, Isaiah 36:3, 22:15-25). Scattered in the village and surroundings are a dozen other tombs. They all belonged to rich Jewish families. Some families were not of Judea, but came from the Diaspora. A splendid example can be found more to the north of the Old City, on the way to Mount Scopus. It is located on the corner of Nablus and Salah ed-Din street. The large complex is known as the Tomb of Queen Helena of Adiabene, but earlier visitors thought the facade looked royal enough to associate the monument with the kings of Judah, which is not correct. The decorations are of grape and acanthus leaves. The grave belonged to queen Helena of northern Mesopotamia. According to the Jewish historian Josephus (Antiquities 20:17-96 and War 45:253) she and her son were converted to Judaism by Jewish merchants in her homeland. Helena then did a pilgrimage to Jerusalem between 46-48 CE, which she found struck by a famine. The queen set out to gather food as far as Egypt and Cyprus. After these exploits she decided to stay in Jerusalem, where she built a palace. When her son died, in Mesopotamia where he had gone back to rule, Helena followed him and occupied the throne till her own death in 64-65. Her bones were sent with her son's to Jerusalem and were buried in the three pyramids of her burial monument. The sarcophage of the queen, with the name 'Tseddan' is now in the Louvre. It was the only chest that escaped looting. During the troubles of the Second Jewish War it was hidden in a small chamber. In order to bring it to its hiding place the corners of the chest were knocked off. The tomb should be visited with a flashlight. The deep-lying courtyard outside the monument was a quarry; cutting the stones left the regular steps. Water ran down the steps and ended in cisterns. Outside and just on the inside the water streamed into basins, which can still be seen, to purify the dead. The actual entrance lies on the north and is blocked with a large stone. First there is a square antechamber, followed by burial chambers entered through narrow halls. The chambers lie on three sides of the central antechamber. Some chambers on the east side of the labyrinthine complex were never finished or used. The minuscule chamber with Helena's sarcophagus was under the floor of a cavity, just after the first chamber north of the antechamber. A secret stairway hid it. In the same area, just off Nablus street, the tomb can be found of Simon the Temple Builder. This can be deducted from an Aramaic inscription on one of the ossuaries that were found in the construction. Simon probably assisted in building the Second Temple of king Herod. The connection to Azazel comes from a passage in the writings of the Jewish writer Enoch who describes the damned valley. It was burning with a fire, in which the kings and powerful people were cast. They were put into heavy chains of iron. Enoch then asks for whom the chains are meant. He receives the answer: "These are being prepared for the hosts of Azazel so that they may take them and cast them into the abyss of complete condemnation (1 Enoch: 54:1-5)." Hinnom is translated into Greek as Gehenna. In the Mishnah this dark place is known as the pit of destruction (Avoth 5:19). The idea that it was hell also comes from the contrast with the Temple Mount: it is the highest point in Jerusalem, while the Hinnom valley is the lowest. There are two well-preserved Jewish tombs from the time of Herod inside the monastery of St. Onuphrius on the southern slope. The first one has been turned into a chapel. Both have perfectly preserved classical facades decorated with varied geometric designs. The monuments have several burial niches with benches on which the dead were laid out. A little bit more to the south, near Ramban in Alfasi street, is the tomb of Jason. There is no connection with the Greek hero, but in this case the family of the high priests of the Temple is meant. The second book of Maccabees (5:5-10) tells that Jason's family was banned in 172 BCE by Menelaus, a rival priest. The next king Alexander Jannaeus restored them, and made repairs to the family tomb in order to prepare it for the burial of his grandson, who was also called Jason. This man was a naval commander, which is probably why there is a charcoal drawing of two warships in the courtyard. Also an inscription witnesses that Jason sailed to the coast of Egypt. Inside there are eight niches for graves, behind a small opening on the left. To make room for additional burials the bones were later removed to the charnel space in front. The pyramidal roof over the courtyard is a reconstruction. The building has only one column. Just south of the King David Hotel is the family tomb of King Herod. It is closed by a large stone. Herod himself was not buried here, but at the site of Herodion. The four chambers of beautifully cut stone were found empty, because they were robbed. That Herod had a family tomb in West-Jerusalem is recorded by Josephus (War). Don’t forget about bad credit cards, when you will purchase swatch watches and wenger watches, you should pay via debit card. The company of emporio armani watches provides insurance of their products.